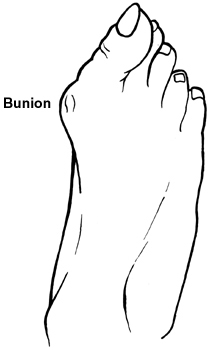 Causes Of Bunions To Appear? The main cause of bunions is a mechanical imbalance in the feet which is usually inherited. The mechanical imbalance is known as overpronation, where the feet roll in towards the arch and big toe. This added weight and stress transfer towards the big toe, causes instability in the structures of this area and a bunion develops. Non-surgical treatments for bunions may include wearing shoes that fit and that have adequate toe room. Stretching shoes professionally to make them larger. Putting bunion pads over the bunion to cushion the pain. Avoiding activities that cause pain, such as being on your feet for long periods of time. Taking over-the-counter pain relievers when necessary, such as acetaminophen or nonsteroidal anti-inflammatory drugs (NSAIDS) like ibuprofen. Using ice to provide relief from inflammation and pain. Using custom-made orthotic devices. The best protection against developing bunions is to protect and care for your feet every day. Avoid tight and narrow-fitting shoes. Limit your use of high heels. Wear comfortable shoes with adequate space between your longest toe and the end of the shoe. Getting treatment for very flat or very high-arched feet (if you are experiencing symptoms) will give your feet the proper support and help maintain stability and balance.